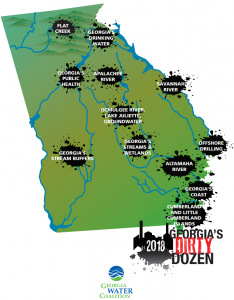 The Georgia Water Coalition has released the “Dirty Dozen” report for 2018, detailing 12 of the worst offenses to Georgia’s waters. This annual report typically identifies the “most polluted places” in the state, but this year’s eye-opening report instead focuses on the politics, policies, and issues that threaten Georgia’s water quality and its residents’ well-being. “One week in March illustrated the extent of the dirt in Georgia’s politics when it comes to protecting our water. March 27: The 19-member Department of Natural Resources Board voted to weaken Georgia’s clean water rules to protect the Rayonier Advanced Materials pulp mill in Jesup. The Board vote was unanimous. An executive with Rayonier’s Jesup mill sits on that same board. Later that week: State budget writers failed to adopt legislation that would end the annual looting of the Hazardous Waste and Solid Waste Trust Funds, programs designed to clean up hazardous waste sites and illegal tire dumps. March 29: In the closing minutes of the General Assembly session, Georgia Power Company, which has thus far made nearly $400,000 in campaign contributions to Georgia politicians during the 2016 and 2018 election cycles, persuaded legislators to keep landfill tipping fees for toxic coal ash 60 percent less than tipping fees for ordinary household garbage. Links to individual sections of the report are available here.